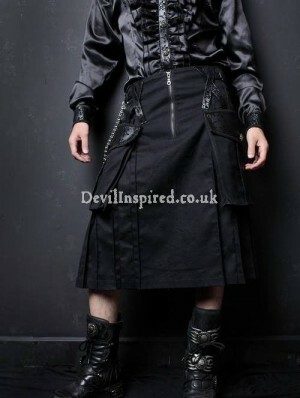 Devilinspired Punk Clothing: How to Make Punk Clothes at Home? It is quite exciting to search the internet to look for punk clothes, as various styles and sparkly decorations are twinkling in your eyes. Are you puzzled? Are you confused? Why not stopping clicking and make punk clothes at home? Yes, you can do it! First let us make a punk shirt. You need an old T-shirt. The easiest way is to spray paints on the T-shirt. You can choose dark colors, such as black and grey. Two or three times are enough. If you want to be unique, you can twist the T-shirt, then spray paints. The next is a punk pants. Old jeans and common pants are ok. You can cut the trousers and make several holes. Then you need to gather the loose material of the legs and put safety pins in the right place. Remember that zippers are important too! You can add some as long as you like! If you are a girl, you can make a punk skirt similarly. Besides zippers, you can glue sparkly buckles on the waist, just be creative! You see, it is easy to make punk clothes at home! You can be unique and punk all by yourself!